Popular programs come and go. What was highly used a few years ago may no longer be used much at all, and in fact could even be inviting hackers into your computer. Why keep an unsecure program that you don’t even use anymore? The program I’m referring to specifically today is QuickTime. 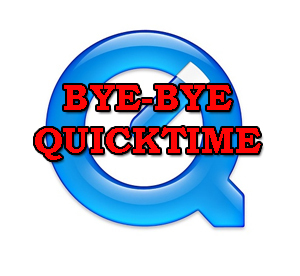 QuickTime is a media player, which means it can play audio or video files. It’s made by Apple, but it is commonly seen on both Mac and Windows computers. It used to be very popular and was often used to play movie files that ended with the “.mov” extension. These days it’s not really used much. Apple has not come out with a new version of the software in more than 10 years, and in terms of computer software that means it’s very outdated. They also just announced recently that they won’t be issuing any new security updates for QuickTime programs running on Windows computers. They are going to continue to support it on Apple computers. That means whenever a new security flaw is found in QuickTime, it won’t get fixed if you’re running Windows. So hackers or scammers would be free to exploit that security problem on your Windows computer, because they know the problem is not going to be fixed by Apple. So you should just get rid of it. To remove QuickTime, just go to Control Panel – Programs and Features and find it in the list. Do a right-click on the name and choose “uninstall”. Doesn’t get much easier than that! Windows Media Player is already on your Windows computer, and VLC Media Player is a free download at http://www.videolan.org/vlc/. Thaks, I deleted QuickTime from Control Panel. Then I did a search and found the following 3 files on my computer. Are they related and should I manually delete them? Tania – I would have to do some more research on this to give you an accurate answer. You can use a program called Revo Uninstaller to clean up the “crumbs” left behind when you uninstall a program. Also, some viruses can rename themselves using some of the file names you mentioned, so I would make sure you do a full virus scan with a strong antivirus program to make sure your computer is clean. I right clicked but uninstall wasn’t on the list.